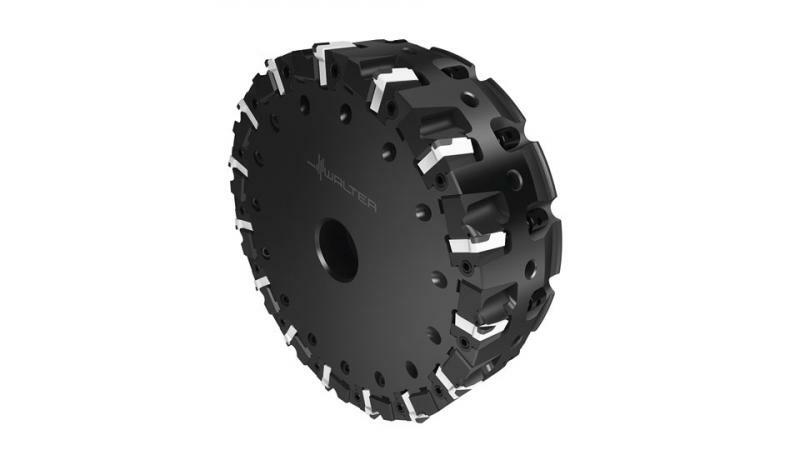 Tübingen-based Walter AG is presenting a shoulder milling cutter that is a logical continuation of the M4000 system concept in the form of the M4130. The idea is to reduce costs through the ability to use universal system inserts in different applications and tools. Tübingen-based Walter AG is completing its range of products for machining aluminium with the M2127 PCD face milling cutter. The milling cutter, which has been specifically designed for high-speed applications, is suitable for finishing and roughing aluminium (ap up to 10 mm). It is also ideal for smear milling (for example of cast aluminium engine blocks) and for finishing bimetal components. Its compact design and special chip deflection elements result in other special features. The sealed surface and exchangeable chip deflectors remove the chips to the side, away from the component. This ensures a particularly high component quality and process reliability because the number of chips on the component is dramatically reduced. The coolant is guided directly to the cutting edge. The M2127 PCD milling cutter features standard indexable inserts, with correspondingly varied possible applications without changing the tool and excellent availability of the inserts while minimising storage costs. The PCD grades themselves have been optimised for each specific application. All indexable inserts feature seating grooves and are fixed in the insert seat with wedge clamps secured against centrifugal forces. This ensures extremely high speed stability and process reliability. Axial cutting edge adjustment makes it possible to adjust the runout with an accuracy of 1–2 μm, resulting in time savings for the user. This makes mass production in the automotive industry an interesting area of application for the PCD milling cutter, which is available in diameters up to 160 mm.